A high-paying job in their 20s (e.g. software engineer), usually in concert with a high-paid spouse. True dedication to savings – most are socking away 50-70% of income during working years. Experiences vary on how to achieve this – some are more ascetic than others. Good financial sense – just solid practices, such as maxing out retirement savings, sticking with cheap index funds, etc. Nothing particularly fancy, though some pretty sweet tax planning to be found. In any case, here are the 3 new blogs on my list. I’ve already picked up a few tips to save on my taxes, so worth every penny of reading! Go Curry Cracker – a couple doing the early retirement thing in Mexico/US. Great transparency on their finances/expenses for how to make things work. Mad Fientist – brilliant resource for tax planning. Jim Collins – a resource for investing basics, particularly stock investing. You said it. Source: Google images. A quick read from this morning’s press turned up an interesting article – Determining the optimal U.S. tax rate for high earners. In brief, the author summarises existing economic literature which empirically estimates the top tax band (NB: the top tax rate in the US is currently 39.6%, compared with 45% in the UK). He finds the top rate can and should be substantially higher, using 3 elasticity approaches. Background: tax policy is especially important in the US, relative to other countries, in order to achieve income redistribution. Americans seem happier to use progressive taxation, rather than cash transfers, to help level the playing field. Here’s some OECD data, summarised by Greg Mankiw, on the topic of US versus other countries in measuring tax progressiveness. The issue: policy makers need to set top tax bands to achieve both needed revenue and a feeling from society that the rich are paying their fair share. The big concern is the substitution effect, which means the rich will work less as their effective (after-tax) pay is cut. The measure of this effect is called elasticity, which is measured in 3 ways by the research quoted in the article. The result: in all 3 cases, the optimal higher tax rate is far above the existing rate – between 57% and 83%. For history buffs, the latter is roughly where the top rate was in the 1930s-1950s. How can that be true? From the article, it seems high earners don’t care about their marginal tax rate – again spitting in the face of rational economic theory. Perhaps they’re working for other reasons than earning a lot, and/or still feel rich with high marginal rates. So what? Part of me reads the article and feels the usual cynicism, e.g. “like that’ll ever happen”. So worth asking why the US would raise the rates…maybe to squeeze just a bit more out of an already progressive tax system, in order to fund more progressive cash transfer system? Also worth wondering what the elasticity would be for leaving town – testing the common argument that high earners will quickly leave town if rates are increased (e.g. London hedge fundies moving to Geneva when the top rate was increased to 50%, only to regret it later). Finally, would hiking top tax rates actually raise additional revenue? The elasticities in the article would hint at ‘yes’, but other authors suggest otherwise. In sum: let’s put these findings in the basket of “hollow arguments the rich make to frighten working/middle class voters into voting against their best interests”. Higher top tax rates may help raise revenue and social equality, with little effect on tax avoidance or decreased effort on behalf of high earners. Let the campaign begin. Source: Google Images. The UK actually has a budget. 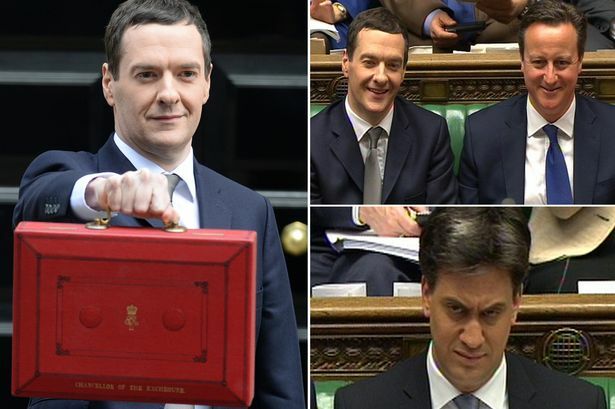 Not well-known among UK folks, but the US is utterly incapable of passing a budget. Perhaps a triumph of separation of powers, or perhaps a prime example of how sensible things can’t pass Congress, but idiotic things can. A clear campaign tool. It seemed to me there were a few programs/expenditures selected for budget inclusion purely to make snide comments about the opposition. Still, if I were in the ‘internet of things’, I’d be happy with the new subsidies nonetheless. Lower income taxes. Yup, still a Conservative government, even if the policy was a Liberal Democrat policy. The increase in tax-free allowance will mainly help middle-class folks; those who should be saving more. Tax-free interest. WOO HOO! Middle-class earners now get £1,000 of tax-free interest a year; higher earners now get £500 tax-free. With today’s average savings account rates of about 1%, that means accumulated cash savings about about £50-100k will earn tax-free. Sweet – this is basically a 20% subsidy on bank interest. Hopefully an incentive to save more. More flexible ISAs. For the non-UK’ers out there, one of my favourite programs in the UK is the Individual Savings Account (ISA). They are tax-free investment/savings wrappers which can be used by any UK resident. Like a US Roth IRA, but you can withdrawal funds at any time. The new rules mean you can withdraw from an ISA, then put back the money in the same tax year. Previously the withdrawals couldn’t be put back. Sell-back your annuity. I see this as a big problem down the road, but one I hope doesn’t hurt too many folks. I’ve written before about the new pension rules in the UK; now those who have recently been forced to buy an annuity can resell for cash. Given annuities are basically individual insurance contracts, I can’t see a very liquid secondary market being setup. That will lead to poor prices for pensioners, who in turn will be easy to scam. Hopefully I’m wrong. Pensioners – less savings for you. Despite the above, the lifetime maximum allowance for tax benefit (i.e. tax-deferral) has been further decreased to £1m from £1.25m. Given today’s annuity rates, the lower cap allows for a lifetime income of about £2,000/month (assumptions: retire at 60, joint, inflation-indexed, no guarantee, no tax-free lump sum). That’s a bit lower than UK median income. So seems a bit stingy to me – it’s a cap which many ordinary savers will probably hit. What I didn’t hear enough of: infrastructure investment. I’ve written before how I view the situation: use record-low government borrowing rates to build infrastructure (and more social housing, while we’re at it). In sum: I’m looking forward to tax-free interest (even with peer-to-peer lending, apparently), and the lower taxes. The rest is kinda ‘meh’, aside from my bad thoughts on HTB ISA and new pension rules. You tell ’em, tea-bagger. Source: Google Images. This morning I read a Huffington Post article by Nancy Altman, which piqued my interest. 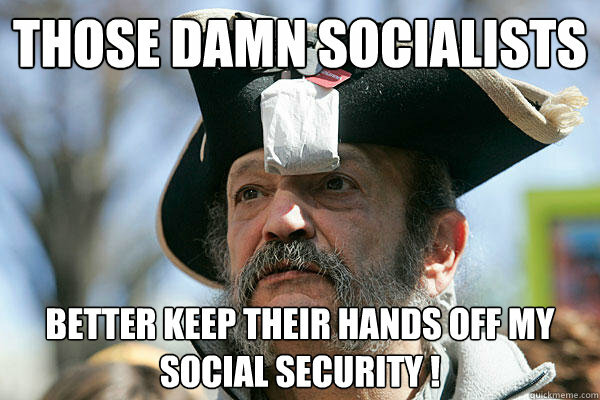 It advocates shifting away from privatising Social Security, or indeed advocating 401(k)s or IRAs, and applying additional taxation towards extra funding and benefits from the existing Social Security system. Isn’t Social Security going broke? Well, yes and no. Investment returns: around 15%. FYI, ‘investments’ are 100% US Treasury notes and bonds. So what? Well, lower yields for Treasuries means lower future returns for Social Security. So that item will need to be supplemented by additional tax, or else benefits will come down. Also, the large cohort of (working) baby boomers leaving behind a smaller workforce will lower the current taxation component. And… that leads to projected deficits, and loss of benefits, beginning around 2033 under status quo. Technically, the loss of any benefit would be a default – therefore bankruptcy or ‘going broke’. The group claims this isn’t the case, as taxation will still be coming in. If only personal bankruptcy worked that way, right? How to fix this? The group suggests abolishing the cap on income subject to Social Security tax – right now income over $117k isn’t subject to SS tax. No mention of removing the cap on SS benefits however – those remain. The progressive in me thinks this is generally OK: maybe the US can follow the UK National Insurance scheme, and tax the extra income by a lesser rate, like 2%. Why not privatise and/or encourage IRAs and 401(k)s? Cost differential? Your run of the mill IRA + fund management charge is probably around 1-2% of assets in the retirement account, per year. Social Security spends about 0.5% of trust fund assets in Administration costs, per year. So one can plausibly argue that Social Security is a more cost-efficient way to save for retirement – though I wonder what is the administrative cost of collecting SS taxes. Return differential? I’ve written before about how good a deal Social Security can be for current retirees, particularly against expectations for future generations. So here’s a thought, keeping in mind where the money for SS payments comes from (see above): given a slowdown in demography (i.e. fewer workers paying in) and investment returns explicitly limited to US Treasury returns, how can there be enough money to go around in future? For example, 30-year Treasury bonds currently yield 2.63% per year. That means $100 of Bonds purchased today will be worth around $220 in 30 years. If we assume the Fed can achieve 2% long-term inflation, and SS benefits continue to rise in line with inflation, that’s hardly any real return at all. And that’s the maximum investment return allowed by Social Security. Sadly, the mathematics just don’t add up unless taxes are raised – hence I absolutely see why the group wants to remove the cap on earnings subject to SS tax. I suppose the amounts sent to ‘auto-enrolled’ 401(k) plans could just be reframed as additional SS tax to help keep up the program, and possibly increase benefits? The only other method I can think of would be to massively increase population through either more lax immigration policy or through discouraging the use of contraception. In sum: I was absolutely intrigued by the idea that, instead of thinking of Social Security as a slowly fading institution of old-time, New Deal America, we should consider the program as a better option for our future pensions. The cold mathematics, however, means pretty unpalatable choices to make this happen. But, as I’ve written before, the millennial generation faces stark mathematics regardless of how pensions are handled – there just isn’t enough money to go around. One of the policies President Obama outlined in his State of the Union speech was eliminating (to an extent) a pretty sweet tax loophole: the tax-free cost-rebase of assets passed following the owner’s death. For example, consider hypothetical farmer Joe’s (age 85) farmland he bought decades ago for $100/acre: suppose the fair value of the land is now $5,000/acre (probably an understatement). If Joe sells his farmland, he owes capital gains tax on $4,900/acre. Suppose instead, Joe dies this year and the farm passes to his only child: the farm passes to the child tax-free, and the child’s ‘cost’ for the land is now $5,000/acre. No capital gains tax to the government. The above situation seems OK-ish in the family farm arena: as a society we shouldn’t force poor Joe’s child to sell the farm to pay tax, should we?? 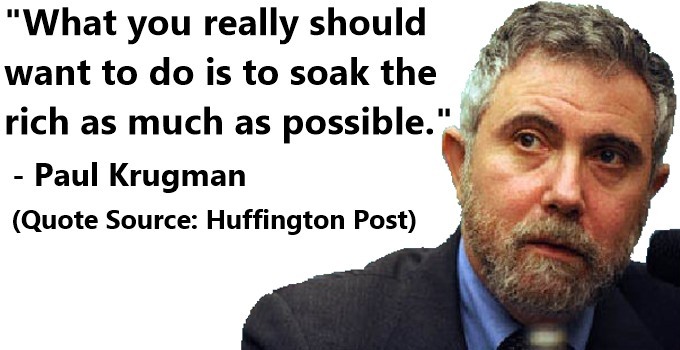 Well, consider that this same process/economic policy applies to HUGE farms, buildings, houses, stocks, bonds, etc. etc. For example, the same story would occur if Joe was a very wealthy ex-CEO with a shareholding of $100 million. Estate tax would be owed, though wealthy Joe would probably have found some ways of mitigating that. Anyway, this policy proposal sounds a bit like the rant I wrote a while ago, about making a serious effort to equalise opportunity; to me, the most justifiable/fair redistribution would happen at death of the elder generation, to improve opportunity for the younger generation. As a side benefit, having punitive death taxes would probably encourage consumption, which is generally helpful for redistribution (i.e. the rich save more than poor, so getting them to save less is likely a good thing overall). As was written in the Economist, this policy idea will likely go nowhere fast. However, their chart of where these long-term capital gains end up hopefully helps illustrate the point that indeed, these gains would be an effective source for redistributive taxation. Hold off the pitchforks!! A bit of navel-gazing/brainstorming today. Articles such as this and this highlight a glaring disparity between what Americans generally believe (e.g. that the US is the best place in the world for a Horatio Alger story, through bootstraps, hard work, etc.) and what is actually the case (e.g. US remains one of the most unequal nations in the world; with stagnant to falling median income; and with one of the lowest proportions of people moving upward through the income deciles over generations). For a nation that enshrines equality of opportunity as almost a Constitutional right, this inequality of outcomes is head-shaking to say the least. And while I understand that equality of opportunity is not the same thing as equality of outcome: what, really, is the point of the former without being able to convert it to the latter? Main tenets of a new system. Vision for how this would work. The rich get richer, as they save more and more each year tax-free. When the grim reaper comes, so does the tax man: whatever hasn’t been spent or transferred gets taken by the government. So the children of the rich benefit from top-quality everything (as their parents buy the best), but cannot rely on a never-ending pot of gold. I suppose this system is somewhat similar to a consumption tax + wealth tax system (e.g. a 50-yearly tax at a high rate, rather than yearly tax at a low rate). In my mind the summary is this: to achieve true equality of opportunity, wealth must be transferred on a regular basis, preferably to achieve higher wealth growth in the bottom 90% than the top 10% (which is the case today). To balance this transfer, the wealthy are given a golden goose – tax-free wealth creation for their (natural) lives, combined with a consumption tax that will certainly improve their lot. Well, that’s a couple hours thinking. Let me know what’s obviously wrong with the logic, please. Let’s just put aside the fact this type of system is completely unpalatable politically – it will be a cold day indeed when Congress comes close to penalising the key groups hurt by a relatively simple and more progressive tax code. He doesn’t go into wonk-ville, but Mr Ritholz hits on a topic very much on my radar these days: US tax policy vis-a-vis expats. As a newly-naturalised dual British/American citizen, I now have a legitimate choice whether to give back my US passport. Why would I do this? Well, the answer is mainly around taxation: the US’s IRS is unique among developed countries in not giving a *&^% where the US citizen is or how he makes money; the IRS gets its share. Thanks to a double-taxation treaty between the US and UK, I only pay the higher of the two tax bills each year; that ends up being the UK (but surprisingly, not by much; and for the extra tax, I get free healthcare!!). However: what if, someday, I end up wanting to live in a nice island community; perhaps one with a super-low tax rate? Don’t worry about low taxes; you’ll still owe the full US rate to the IRS. Some of these same islands may not have double-tax treaties, in which case you’ll owe both countries. The UK is much more sensible with taxation, at least in terms of only taxing citizens if they’ve UK earnings and/or resident in the UK. If you’re a Brit living in America, you don’t owe the UK Inland Revenue for your US earnings. So…maybe one day I’ll have a great passive income stream. Maybe that income stream will pay the bills for living in a low-cost, high-sun environment. Then I’d consider giving up my US passport.